It’s unlikely you’ll find anything if you look for “Hart Authentic Orange Chicken” online – at least I didn’t find anything when I looked. It seems that this frozen entree is made by Hart Food Products from Lakewood, CA. I bought it at Grocery Outlet, and I imagine they are their only distributor. Actually, given Hart’s pathetic website, it’s difficult to believe they are any sort of serious company. Which really tells you something about where Grocery Outlet sources its products. And indeed, orange chicken seems to be one of only three or four products Hart offers . It’s not obvious from the picture in the package, but this is really popcorn chicken – which is annoying as that means it has much more breading than you would like. It’s uncooked so you need to bake it for 20 minutes, pan fry it for 10 to 15 minutes, or deep fry it for 6 minutes. Then you mix it with the orange sauce which comes in 3 packages. You can’t microwave it. As for the taste, it met our very low expectations. Mike found it too bland, while I thought the chicken had a subtle “off” flavor. The sauce was OK, somewhat orangy and not too sweet. I’m unlikely to buy it again. The owner of Hart Chicken e-mailed me a few weeks ago and told me they’d made changes to their product and to give it another try. I was reluctant, because one of the changes involved getting a different supplier of chicken pieces that produced more uniform – but smaller – pieces. I figured one of the major problems was the size of the pieces, so this wouldn’t help. But I figured I would give the product another try (though it would have been nice if he’d sent me a coupon rather than I having to buy it myself) and I was happier than the time before. The pieces are still small (they need to be in order to be ready within a reasonably period of time, given that they are not pre-cooked), but this time I went into the meal experience thinking of it as popcorn chicken. So I wasn’t disappointed by their size. I also used much less oil than the instructions called for, which you can do if you stir fry the chicken. The sauce was supposed to have an improved flavor, and I think it did. It was just the right amount to coat all the chicken – though a bit more would have been welcomed for any rice or veggies you might want to throw in. I did note this time that the sauce takes on a full 10 oz of the 32 oz of the package, which is quite a lot. Anyway, Hart Orange Chicken is still not for me, though as you can see below it has many lovers (and haters). I just made this for dinner-it was a quick meal with a salad and rice. Split my pack into thirds so I’ll get over 6 servings out of a package. the product had to much batter and not enough chicken and I cooked it the recommended best method and it came out very hard. The sauce was decent but there wasn’t enough to cover all the chicken I will not purchase this product again as well as I bought the teryaki chicken product I am going to return it to the store for something else. I was completly floored when I saw the size of these “chicken” pieces. I wondered If there was any chicken in them at all. Some were only barely bigger than the size of a pea! I found myself tearing them apart to try and locate anything eles besides breading, and was very disapointed!!! Do you have a number that I can call you to discuss getting your product in the South ?? Good for you and best of luck! My family of 5 here in Michigan love your Orange Chicken. I do not know if you have anything to do with the price but it is reasonably priced easy to make and fillling for my two sons daughter husband and I. In a society that rarely tells you when you do well I felt inclined to take the time and tell you that my family enjoys your product. Although stating rather to thaw or not would have been nice the first few times. I bought your product thought if was a flook thought I got the bottom of the barrel”crumbles”didn’t even attempt to cook /fry it..my pig will eat anything.the picture looks nothing like the product.will not buy again.re the fact “your terrified” if the heat is to hot get out of the kitchen.I am however impressed that you suggest a refund?? I for one purchase the Orange chicken meals often. My husband and I have rough work schedules that sometimes require a quick and easy meal for us. I think the value of the product is awesome, especially with our failing economy. I have purchased competitors brand and get half of the amount of food, for double the price. Adding an onion, a bell pepper, or even broccoli can add flavor. Even though the chicken pieces are small, there is a lot, which means I usually can take the lunch the next day with me to work too 🙂 The website is humble, but to the point, which I feel is an element that too many companies look past now-a-days. The website structure however does not take away my impression of the food, or the good taste. My husband is a chef – and believes food is what you put into it! We cook white and/or fried rice with it as well. I will definitely continue to buy this product & even try the new pineapple flavor due to come out this year. While on a scout to remind myself where I had bought this product,I came across this blog. I find it to be very, very, well, wrong! I have bought the Orange Chicken before and my 5 kids, husband and I love it. I have even made it for a church function and last Monday, many many months later, I got another call from a church friend wanting my recipe. I happily told her it was Hart, as I did with the at least 15 or more people who also loved it. This is one of the few dinners that I can make and not hear any complaints, and if you have any kids, you know that is a good night! I have added my own twists to the chicken just to change things up a bit. For example, Panda Express sells their sauces now, and they are great on Hart chicken. Or I have made my own sauces. We also own our own business, so this has been a life saver on the nights we work late! I wish people who write blogs about things, would first stop to think how it may impact the company. This is a good, hardworking family business and these types of hurtful things can hurt it. There are other things in this bloggers post that bother me. The mention of the “pathetic website” I find has nothing to do with how the food tastes. It just shows the integrity levels of Marga. I find it sufficient, it tells the products it makes and recipes. I encourage you to buy the product and make your own educated decision, because the one posted definitely conflicted with ours! Thank you Hart for making my job as a mother a little easier! Stumbled across this product at a local, small chain grocer in NW Indiana but I think they are a member of a larger buying group conglomerate. to enhance appeal. Given the generous amount of batter I was not inclined to combine it with rice. Yes, this product reminded me of popcorn chicken and I was expecting larger chicken chunks and less “crumbs”, with more size uniformity of the package contents. Having recently acquired a deep fryer I found it amusing the preparation instructions mentioned deep frying as an option. Although I returned the deep fryer before ever using it the instructions mentioned best results are obtained if the food being fried is similar in size/weight, which relates to my earlier comment regarding uniformity. If the owner happens to return to this forum I’d be interested in confirming if the meat used is injected with NINETEEN PERCENT solution, which impresses me as an excessive amount. The sodium content was dismaying so I only used ONE (of 3) sauce packets, which was added during the last few minutes in the electric fry pan. I would not have purchased this (unknown) food product had it been priced greater than $2, despite the signage which indicated a savings of $3. $5 for this product was not conceivable, but it did influence my purchase decision, along with that impressive size chunk of chicken featured on the front of the package. I might try another bag or two given the fact I have a bunch of green peppers to get rid of, but it will never become a regular item on my shopping list. This particular food store regularly has specials on chicken legs and thighs for .49 to 59 cents/pound, which translates to $1.00/lb after the skin and bones are removed…..and it is not solution injected. If I may be as blunt as you – I find your “professionalism”(and I use the term lightly) in being a food critic amazingly shallow. You look down your nose at a start up food company that their website isn’t up to Your par, and continue on with your spew of obsessive belittling of even the store (Grocery Outlet) which, and I quote “Which really tells you something about where Grocery Outlet sources its products.”. This shows your amazingly poor knowledge in what products G.O. carries! Products that include, Star Virgin Olive Oil ($30 a bottle else where! ), Kashi cereals, to name just two product of which -IF you TRULY knew your products you’d know that they are among the best in their field!! And then you come back to bad mouthing – as if now your opinion after showing your lack of knowledge about the G.O. stores products matters on if Harts Orange Chicken is any good or not. 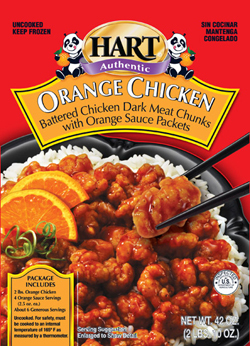 Let me say right now, Hart’s product line and their Orange Chicken – – of which IF YOU COMPARE them to ALL other “Orange Chicken” products – Harts’ is the Absolute BEST !! – bar none!! I’ve tried them all, including the all white meat Foster Farms Orange Chicken, and if I may say, none of them come close to the amazing taste and value you get from Harts Orange Chicken. Apparently value means nothing to you – (you must drive a Range Rover, or a Rolls or a similar “status” auto) but trust me – I do “just fine financially”(understatement), and I am not ashamed to shop for a value in great tasting food! Also, I am not afraid of spending whatever it take either to get the best tasting food for a certain dish if taste only is my objective for that meal – but how nice it is to see a product that covers both best taste and best value. Harts Orange Chicken does cover both avenues very, very well. It’s such a shame your eyes, wallet, and pallet are so “Close Minded” to this wonderful product. In closing, I am thankful for your last statement that you are “unlikely to buy it again” for that means my daughter and I will have more for us! – two people that need to sign up for “Orange Chicken anonymous thanks to Harts Orange Chicken! I for one love these little things, though only the Orange and Hawian bags since these 2 have the chicken preseasoned with some salt and pepper corns. Where as the other one with the purple label is just plain breaded un-seasoned chicken. What I usually do is defrost the bag in my fridge overnight. Then get a little pot with oil in it, get the oil up to about 360-380 degrees F. Put the chicken in for about a minute only, since the chicken is at 44 degrees already, it’s not much work to get it up to a cooked internal temp of 170. After that I put them into a skillet(mum uses wok) slighty drained but still a bit oily since I also add mushrooms, onions, bell peppers, zuccini as well. After they are stirred up a bit, I add my own sauces which is a blend of Oyster sauce and a light habenero sauce to give it some kick. Then stir that around, and serve. The orange sauce packet is fine but if it tastes Orangy, you added way way too much. Basically a 6 foot grown man’s two hands full of chicken should have about half of the bag, not the whole thing as it says 1 bag per serving, make it half and you’re fine. Also you’re suppose to add veggies, not eat it straight since the sauce has things in it that accentuate the flavors of onions, tomatoes, zuccini’s and things of that nature. Ofcoarse this is coming from a fat man’s taste buds. I tried this tonight. It was horrible. Sorry, all 4 members of our family thought it bland and unrecognizable as any kind of meat. It was all batter. We served it with asian rice and green beans. The sauce was okay, not very flavorful but the “chicken” was non-recognizable as any sort of meat. Disapointed. I am having surgery tomorrow and am very busy getting things done prior to. Thought this would save me some time (Saturday dinner, Sunday (today’s) lunch. Very dry. The pieces are really small; some so small I was wondering if I was just eating batter. I would love my money back. I could not believe this trick bag of dough. Feeling the bag in the store made me purchase this of sorry flour bag of no meat at all. It was full to the top making the consumer think of all the chicken that’s in the bag !NOT! The sauce was decent but after that start wishing for a miracle in the pan. This is the the true meaning of ! HOT MESS ! I want my money 4.95 back . Wow! Hart definitely has quite a few defenders. I’m sorry if my review offended some people, but I write it as I see it. Hart’s products may be cheap, but it doesn’t mean they are a good value. Given how long it takes to make them, you might as well get some boneless chicken (sometimes available at Grocery Outlet as well), and saute it. GO has a few sauces that could go with it, though I have to admit I haven’t tried any. Anyway, I also tried and reviewed their orange beef. BTW, GO also sells a very good frozen orange beef by Contessa. This is more expensive, but much, much tastier. We LOVED the Orange Chicken! And cannot wait to find more in our store. Wonder if we are bland or are the other writers expecting to much? Was sure surprised to read their comments. Please continue to send your product to our store, Walt Churchill’s in Maumee, Ohio. I am trying to introduce mores salads into my diet and wanted a little variety. Cooked up your Pineapple Chicken and tossed a single serving in my salad. Threw the mix in a pita. Wow. I feel like a ate a big meal and I it satisfied my taste buds. I can’t wait to try the other flavors. My roommate and I tried the orange chicken. We both found that the chicken had too much breading. When we bit into the meat, we both spit it out and dumped the rest in the garbage. The meat was disgusting and perhaps rotten. This was the worst $6.00 I ever spent. This product should be removed from stores immediately. I have had this orange chicken loved it . We wanted it again but cant find it in our local store to get more soon. I am only on this page because I am seriously looking for a grocery store that carries this product. Hart Orange Chicken. We bought it per chance (and we think it was at Walmart) and this was the ONLY orange chicken that I personally liked. We separated it into 3 dinner portions, cooked it with stir fried onions, red pepper, green pepper, and added brown rice a the end. It was awesome!. Now we can’t find it. The other orange chicken packages are a waste since they are over priced, I can’t divide them, and they come with white rice which I don’t want. Please let me know where I can find this product in the Tucson, AZ area. And I wish your company success in the future. I actually pay 4.99 a package for orange chicken and my son and I love it. I serve it with white rice. We have either orange or terriaki chicken once a week. Its not “pea size”, it only take 15 minutes to cook. Thank you for the great product! To those trying to find it, its carried in Kroger/City Market stores…In the meat department, not the regular frozen section. I suggested the orange chicken and teriyaki chicken at food4less with some white rice this stuff is great. Not much to it but frying or oven baking . Will keep buying it! my fiancé recently bought the “orange chicken” and made it for our dinner. what a disappointment! the package says “1.54 lbs. of chicken”, which is true, IF you weigh it in the bag, with all the breading (which is mostly what you get), and the orange sauce packages, and when frozen. we found VERY LITTLE chicken in this product, and we will NOT be buying this rip-off of a “meal” again. I have sent an email to the email address listed, and have not heard back from them yet. don’t waste your money, unless you have a taste for orange flavored breading, if you really want chicken, buy something else. I like Hart products, I find them very satisfying, especially when I am feeding 8 teenage boys, I mix rice and veggies and they eat it up, there is never anything left. I love your product, but finding it hard to locate. Can you please give insight on where I can purchase your product. Great job by the way. Keep up the great work!! I just bought your breaded orange chicken and my husband and I enjoyed it very much..I made broccoli as a side dish. I am very pleased with the orange chicken, as there are only us two now. I THINK IT WAS GREAT….. This was my favorite orange chicken out of all the frozen ones I’ve tried. It tasted the freshest compared to homemade and was quite affordable. The sauce is good and flavorful. I added some dried hot pepper to make it spicier and served it with jasmine rice and steamed broccoli. The size of the chicken pieces didn’t bother me because it’s necessary in order to cook faster from frozen. I pan-fried mine in 2 tbsp. oil and scooped it out with a slotted spoon so I didn’t have excessive crumbly bits. Hart Orange Chicken was ALL batter. There was no chicken and was a total waste of my time. I have never taken a product back however, I will tomorrow. That was the worst thing ever!!! I got a bag from Kroger’s. It was my first time trying them n i loved them!! will be buying more!! I don’t know what everyone is talking about the bag I tried (teriyaki) was delicious and had a good ratio of batter to chicken with the exception of a few small pieces. I fried it with a little oil and covered them in low heat and they came out tender. Maybe the person who said they were hard should try that. All in all my boyfriend, his parents, and I found this to be very tasty with steamed rice. Ok so i got another bag from county market n the Orange sauce was dark n the chicken was smaller. I dont know what happen!!! but i will not buy them from there anymore.. But i will try another bag from Kroger’s. Frankly this has nothing to do with ethics but actual taste and value and everyone is absolutely entitled to their own opinion and frankly I agree with the reviewer and totally disagree with you. First about ethics, while they may be a startup, and have a good refund policy, there are hundreds of thousands of other small mom and pop companies going through hard times or out of business that don’t use their difficulties as a reason you should try their products. Maybe in their about me page or what not they’ll reveal more but the ones that stay in business focus first and foremost on quality and sourcing as well as addressing customer concerns. Now Hart did right by offering a refund, but to add vegetables as an option? Why not just dial back on the sodium instead? Second I hate to be truthful but I think anyone could do better with a cup of rice, $2 worth of chicken and an allrecipes orange chicken recipe. The amount of sodium and salt in this package is way too much but the one thing they have going is you just need to heat this. So to me this isn’t really a value market but convenience. Lastly I encourage people to be aware of what the product actually is and not to compromise their health for packaged foods or sad stories if they don’t want to. IMO it’s not worth putting in cheap stuff into your body, buying into guilt trips, and so on and so forth. Eat what’s GOOD for you as the trend nowadays is that people pay more for organic and whole foods because that is what will sustain you. Btw my response was to Katie and David A. And David, insults to the reviewer sure make me question your origin. Sure you don’t work for Hart Foods? I tried the general tsos chicken for lunch just today for the first time. I loved it I will definitly be getting it again and be trying other flavors. All I have to say is taste. Who cares about the size of the chicken. It means more sauce in each bite. After buying a foster farms brand I won’t try any other brands than Hart. Besides the price the taste was horrible. I just went shopping today and grabbed 7 bags of the Harts and I’m going to enjoy every one. So thanks Harts for making food I love. I love Hart Orange chicken and am looking all over the country for a place that I can buy some. I live in Southern Oregon and will travel to the ends of the earth for a case or 10. Anyone have any leads for me? Appreciate all the help I can get. There are Grocery Outlets in Medford and Bend – you can call them and ask them if they carry it. Call Hart and ask them where in Southern Oregon they carry their products. I need to know where in Missouri to buy it. I love the chicken. My family and I love the Hart products. We have been eating them every week for 2 yrs. But now our Food4Less has quit selling the products. I dont see them at Walmart either. We cant find anything wrong with them. Will have to look for a place that sells them. I add a little teriyaki sauce in the pan and then I have more sauce. The other brands were too pricey and didnt have hardly enough sauce on them. I just bought this product at my local Kroger here in Georgia. I need to know if the product needs to be thawed or not. There are no specifics regarding it. I used to love it on how easy it is make. I used to make it at least once a month. But today I just ate it tonight and there was a bone about an inch big that was actually breaded so I will not be buying this product ever again. Not only did I love it so much that I have had it 4 times this week. I have also bought out there entire supply at Kroger and made sure to pick up a rain check so I can get more next week at the sales price. I love chinese food. I eat it everyday. When I purchased this product, I did not have much of an expectation as every brand of frozen foods has a ‘less’ quality than eating out at a restaurant. I spent barely 18 minutes, from start to finish, preparing, cooking, and serving, including making my steamed rice. Though the size of the chicken pieces are small (I actually prefer it this way because larger chunks tend to be fatty in taste), each piece did have chicken in it. Yes, the tiny ones were only batter, but overall, most of the pieces had some meat. Also, there was the lack of a fatty chunk, which always ruins a meal for me. The sauce was FAR from being bland. It was flavorful and had some heat. Not the best, but satisfactory. Easy to prepare, decent to the taste buds, and nice on my wallet. 4 stars! First time to Marga.org, and unlikely to return again. Love it. Tried it today for the first time. Fixed in the oven, then pan fried for a few minutes. I found it to be all chicken and lightly breaded. My husband likes it much better than at a Chinese restaurant. Definitely worth the price and definitely are customers. I would like to see what other products they offer. This crap should be called bread crumb whatever, sure didn’t find any chicken. Somehow the orange flavor got left out of my sauce. Pretty sure won’t be buying this garbage again. I bought their sweet and sour chicken–YUCK!! I read the ingredients, and there is no fricken chicken in it! The next time I need to vomit the first thing I will think of is “Hart’s Orange Chicken”. The packaging looks great but the food quality is complete and total garbage. I am ashamed Bill Hall (the owner of this monstrosity) can proudly put his name on this. I seriously hope he does not feed his family this product. The sauce tasted like vinegar mixed with a rotten orange. The “chicken” I use that term loosely was a breaded mush the size of a penny. Since Hart put in a USDA meat processing facility you would think they would actually process good quality chicken. I hope it really was chicken and not some stray cats outside your facility in Paramount CA. Can you say PRODUCT RECALL? I accidentally put the sauce in with the raw chicken to cook it. So it got cooked together. Can I still eat it? That won’t make me sick will it? Sorry I didn’t see your message. And no, as long as you cook the chicken through, it won’t matter you added the sauce as well. What you might want to do in such circumstance is add water, so the sauce doesn’t burn.